HÀ NỘI — In front of the headquarter of the Hà Nội Department of Planning and Architecture on Tràng Thi Street, dozens of motorbikes and cars stop, wait for a while, look around, hoping against hope that by some miracle a parking space will materialise. The department’s yard is jam packed with employees’ vehicles, leaving visitors to park elsewhere, often on nearby pavements. This system worked, more or less, although pedestrians were often forced to walk on the shoulder of the road, until about a month ago when authorities launched a campaign to clear up the sidewalks of parked cars and sidewalk cafes and beer joints. Business owners have since been complaining of losing customers who cannot find parking. Trần Thị Lê, a souvenir shop in the tourist-magnet of Hoàn Kiếm District, said she totally supports the city’s pavement clearance campaign, however, authorised agencies must reconsider the planning and legalise parking to address local demands and support business owners. Hà Nội’s police data shows 5.5 million vehicles in the city, including five million motorbikes and half a million cars. This figure grows monthly by about 28,000 - 20,000 motorbikes and 8,000 cars. According to a survey conducted by the Tiền Phong (Vanguard) newspaper, 178 legal public parking lots operate in the city and are permitted to collect parking fees. These include major parking areas such as the Ngọc Khánh, Mỹ Đình, Đền Lừ, Trần Nhật Duật, Nguyễn Công Trứ and Nguyễn Công Hoan parking areas. However, the newspaper also pointed out that these lots only meet less than 10 per cent of the parking demand by locals. More than 80 per cent of vehicles, equivalent to 4.9 million vehicles, are thus parked illegally on streets, alleys or around apartment buildings. The saga parking began when the city had far fewer vehicles. Four years ago, in 2013, the Government issued Decree No 100, a stop-gap measure allowing parts of the pavements in big cities like Hà Nội and HCM City can be utilised for parking. But two conditions apply - the street must have two lanes for motorised vehicles and one lane for non-motorised ones. and a 1.5m-wide strip of pavement must be left for pedestrians. 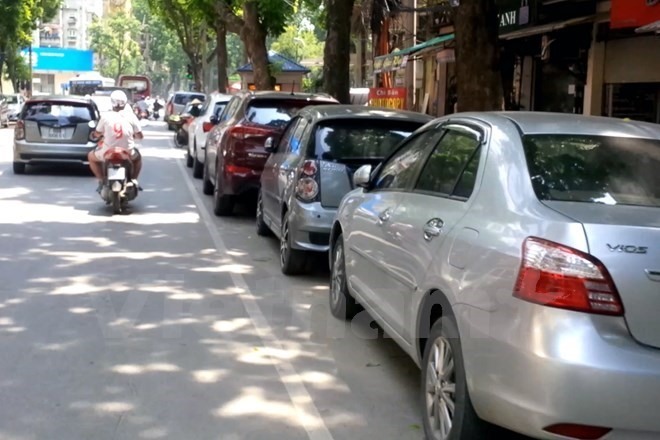 A representative of the Transport Development and Strategy Institute told Tiền Phong that 50 per cent of the streets in Hà Nội now have the required pavement width to qualify for parking under Decree 100 conditions. However, vehicles still park on other streets with narrower sidewalks, leaving no room for pedestrians. In 2003, Hà Nội authorities approved a plan for a network of public parking lots in the city, stipulating that parking spaces must make up two to 3.5 per cent of urban construction land, compared to the existing 0.1 per cent. Fourteen years on, a representative of Hà Nội Transport Department confessed to Tiền Phong that the project was a flop and that instead of setting aside space for vehicles, the allocated land plots were turned into skyscraper and shopping mall projects. A 1,400 sq.m lot at the intersection of the city’s Hai Bà Trưng-Hàng Bài streets, for example, was planned to house a multiple-floor parking space, replacing parking areas on the streets of Hai Bà Trưng, Hàm Long, Hàng Trống and Bà Triệu. Instead, a huge complex comprising a high-end trade centre, offices and apartments occupied the space. Local authorities added a list of 50 parking lots to be built from 2011 to 2015, including 24 areas that were planned for completion by 2013-14. Most of the contractors have since gone backrupt or managed to shift the purpose of the land. Learning from failures, the heads of the Hà Nội People’s Committee assigned Hà Nội’s Construction Planning Institute, municipal Department of Transport and relevant agencies to review the old planning and prepare new planning for a network of bus stations and parking areas in Hà Nội until 2030, with a vision to 2050, as a long-term solution. The detailed planning will be discussed by experts and local authorities of 30 districts and towns before being submitted to city authorities. The city also assigned the Hà Nội’s Department of Transport to prepare mechanisms for the urgent construction of parking spaces, including five underground parking lots. Trần Đức Hoạt, deputy director of Hà Nội’s Department of Planning and Investment, said that such mechanisms serve as a decisive factor to attract enterprises to parking lot investment and assist them with payback.